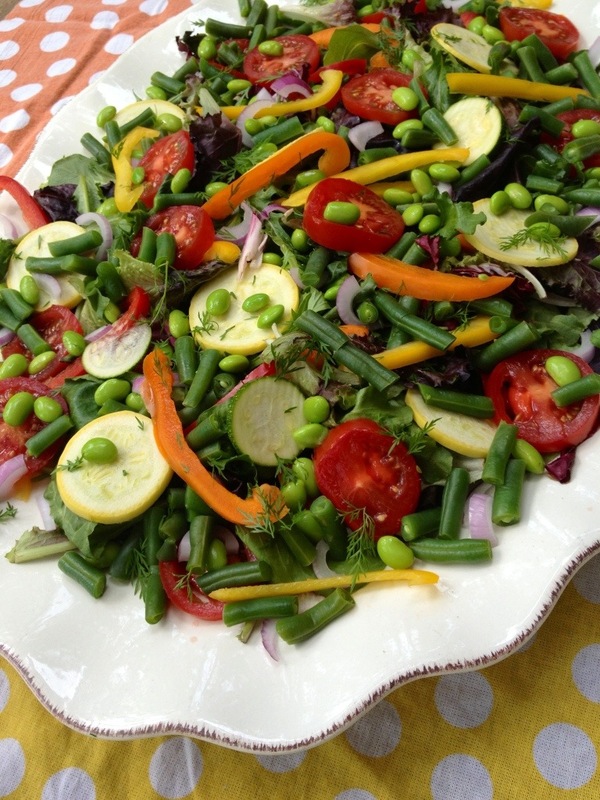 I put together a new salad featuring edamame this week in preparation for Bean 2 Blog, a super fun blogging event at P. Allen Smith‘s Moss Mountain Farm, hosted by P. Allen Smith and The Arkansas Soybean Promotional Board. Edamame makes a regular appearance on our table, as a dinner side or an afternoon snack. The kids love it and so do I, so I am excited that my state is growing more of this great crop. Edamame is basically a common soybean, but it is harvested at the peak of ripening right before it reaches the hardening that makes it a dry bean. We learned at Bean 2 Blog that our nation’s first plant dedicated to the receiving, processing, packaging and shipping of edamame was built right here in Arkansas last year. The plant in Mulberry is also directly helping Arkansas farmers to grow more edamame by contracting with farmers to plant acres (900 in 2012) of this soybean variety. All the bloggers got to bring edamame seeds home that have been researched and produced right here in Arkansas. The soybean plants that make edamame are actually different from the soybeans that are grown for other uses. Edamame plants are not genetically modified and many of them are grown organically. I am totally going to take my seeds to Sandy and Michael’s land to plant. 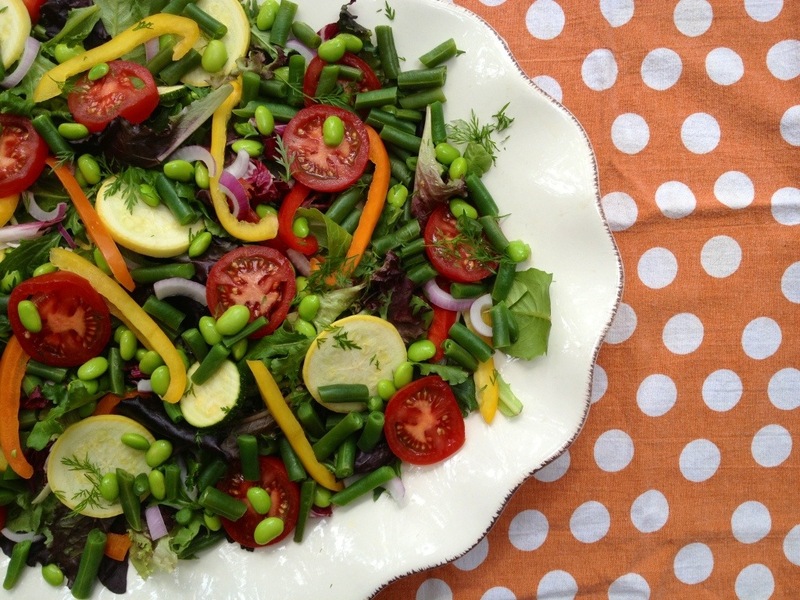 This salad is a bright, colorful cornucopia of summer. Different colored peppers and purple onions give it stripes of color, but then the tomatoes and edamame make it pop. Happy day! 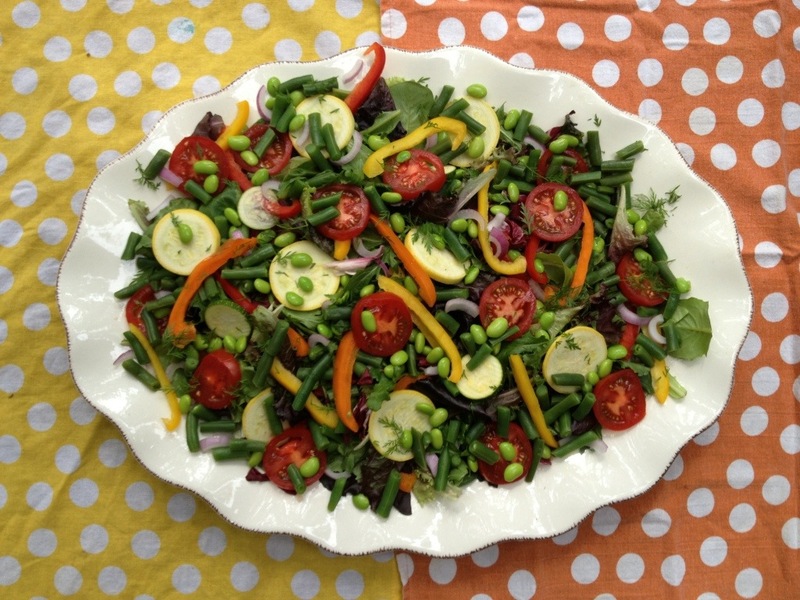 A beautiful salad that tastes delicious and is good for you! High in protein, fiber and iron, edamame is a super legume. Arrange all ingredients on a platter or in a large bowl. Mix dressing with a whisk or blender. Pour over salad just before serving. I can’t wait to make this. It looks delicious and perfect for a hot Arkansas summer. And it’s heating up fast around here for sure!! Looks very fresh and healthy. Thanks for sharing.